Sorry guys, a better Tuscan bottle of ambrosia will not be had, nope. This is the legit stuff. Incredibly classic, mouth-watering and priced to bring a tear to your eye. DO. NOT. MISS! Man, we love this label. We love the wine, too, of course, and the Nunzi family’s beautiful Tuscan dream-farm, replete with every magical postcard image of Italian wine country you ever saw. The CELLAR --- seriously, it dates back to the 1400s! Just a fantastic little find -- truly amazing. BUT -- the wine! Chianti, if you’ve been paying attention, is hotter than ever and making HUGE qualitative strides in recent years. For what is relatively “bargain drinking” (at our price, anyway! ), this crazily over-delivers. PURE, singing bright, clean and sappy Sangiovese fruit, a whiff of toasty woodsmoke, a zip of bitter chocolate. Terrifying, actually, considering how fast you and your friends will empty this bottle and the several to follow after it!! $15!! It’s unreal. While it lasts…! The Nunzi Conti Family began their adventure in the wine business at the end of the 19th century when young Gualtiero Nunzi left his small village in the Tuscan mountains and moved to Florence. Tenuta villa Barberino is located in an area that, thanks to the mild and sunny climate, has been used for viticulture for many centuries. The estate covers 80 hectares including 27 hectares of vineyards and 12 hectares of olive groves. Here the flourishing nature provides a home for a rich variety of flora and fauna. 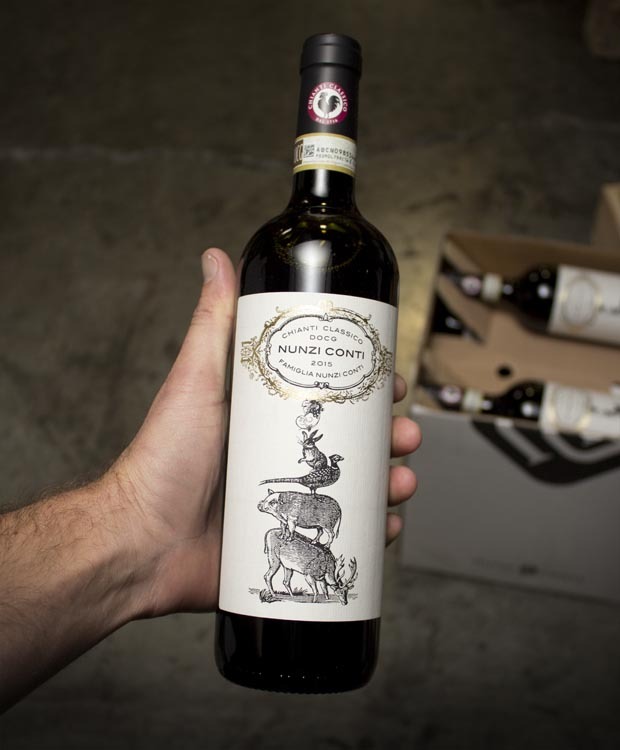 As the label of their Chianti Classico Nunzi Conti shows, meandering through this area, you are likely to come across some of the local animals such as goats, wild boar, pheasants and hares. The richness of the area has allowed our family, which has been involved in winemaking for generations, to cultivate vines of extraordinary variety and age. In our vineyards, some with vines that are over 30 years old, we have mainly local grapes including Sangiovese, Colorino and Canaiolo as well as a small proportion of international varieties such as Merlot and Cabernet Sauvignon.